One of my goals is to try to make at least one person happy every day. As it turns out, this doesn’t take much effort. Yesterday, I made at least 20 people happy before 8:30 AM, and it’s amazing how good I feel! Here’s what happened in my smiling experiment. 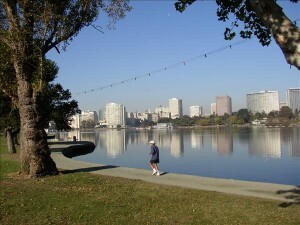 I got up early and met up with a friend at Lake Merritt in Oakland to run around the Lake. Jenna did one lap with me, and then I did a second lap for a total of about 6.5 miles. It was a cloudy and cool day, but there were a lot of other people running and walking around the lake. After Jenna left, I decided to see how many people I could get to smile. So one by one, as I was passing people, I would look them in the eye, and smile, and sometimes wave or say “good morning!” Most of the time, people smiled back, and sometimes nodded their head to acknowledge me, and often said “morning!” back to me, like I was an old friend they happened to run into along the lake. It was great! Of course, some people were too absorbed in their own thoughts, or were talking on their cell phones, or were too afraid to look up and see that there was a runner who was smiling at them. I do think that a few of the people that I passed were not interested in having any sort of eye contact with anyone – not just me. But seriously, MOST of the these people whom I passed smiled back and seemed genuinely happy in that one little moment. As I approached, a few of these people looked downright sad or down and out, until I smiled and said “good morning.” And then they lifted their heads and looked at me, and the sides of their mouths turned up and I even saw some friendly teeth. It was a complete emotional turnaround in a split-second! Smiling is so easy and requires no energy. And yet, when you look someone else in the eye and smile at them, and they look at you and smile back – you’ve both exchanged some positive energy – and even created a lot more positive energy – than existed before that moment. This positive energy seemingly came from nowhere – and it was completely free. We can all have that same positive energy. Just smile at someone else! There is plenty to go around!